There’s no subject more ignored, shunned and discounted by the mainstream media than that of UFOs. It’s absolutely true (this refusal to report, that is) and for the life of me, I can’t understand why. The implications of the ostensibly deliberate disinterest are unfathomable not to mention those of a government cover-up. In fact, the prominent ufologist Stanton Friedman calls it in effect the Watergate of the millennium. The subject of flying saucers represents a kind of Cosmic Watergate, meaning that some few people in major governments have known since July, 1947, when two crashed saucers and several alien bodies were recovered in New Mexico, that indeed SOME UFOs are ET. As noted in 1950, it’s the most classified U.S. topic. And note, he unabashedly calls them flying saucers and not UFOs. How can this subject, the subject, the existence of extraterrestrial beings, especially now as the latest iteration of Star Wars breaks all box office records, be of no interest to the media? And moreover, as newsrooms are shuttered, as news resources are pared and slashed, as the current crop of journalistas are desperately shaking the bushes for something, anything, to report on or cover, how can the most fascinating subject that has captivated humans since time immemorial not be leapt upon with the usual ferocity? A cursory review of the Internet reveals numerous countries along with the Vatican openly acknowledging the existence of UFO files and investigations. Do you mean to suggest there exist no enterprising media types who are unwilling to vouchsafe the fact of the investigations themselves without verifying or acknowledging the existence of alien life and interstellar adventure? 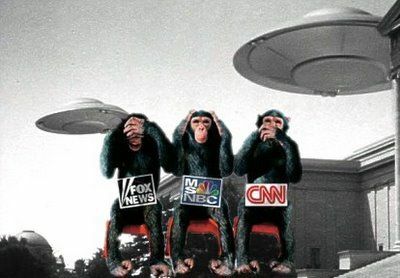 "...The Pathetic State of The Mainstream Media’s UFO Coverage"
We are constantly being lied to for our "own best interests" as the government is wont to say. I personally am sick to death of it. I am also sick of the number of people who have told the truth and been labelled a kook or should I say libelled as a kook. I wonder how many times US government agents, the so called "men in black" have terrorized ordinary people because the broadcast what they had seen. All of this government activity is unConstitutional to my mind and when the true story is finally told I would love to see thousands of lawsuits hit the government and its agencies for the damage they have done to Americans over the last 7 decades. I've come to believe the Gov. has a heavy hand in what the MSM reports or not reports. The panic excuse might have been true back in the 40's but not today.